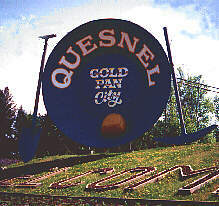 Quesnel Part of the BC Adventure Network. Over a million web site visitors annually ! Built at the junction of the Fraser and Quesnel rivers, this settlement grew rapidly as a way station on the route to the goldfields. By the early 1860's Quesnel Mouth, as it was known then, had two hotels, two stores, the Hudson's Bay Post, a telegraph office, grist mill and lumber mill. Paddlewheel steamers stopped on their way up the Fraser River from Soda Creek to Fort George (now Prince George). Saddle trains packed goods between Quesnel and Barkerville. As in the past, Quesnel continues to attract adventurers on their way to the goldfields and the restored gold rush town of Barkerville. Reminders of a colourful past survive. Visitors will enjoy stopping at the original Hudson Bay Store (a log structure built in 1859). Across the street is a Cornish Water Wheel and boilers and iron parts from the first Fraser River riverboat to travel to the city. 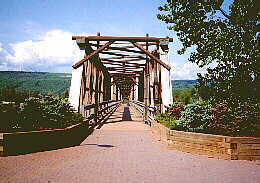 Then stroll the old Fraser River Bridge to west Quesnel. Built in 1928 the old bridge now serves foot traffic only. Continue through Riverfront Park and the walking trail that winds past historic points of interest and along the banks of the Quesnel River. Flower displays on streets and bridges add a picturesque charm to this modern thriving city. Main Industries: Forest products, pulp & lumber; tourism; agriculture; transportation. Access: Located 120 km (74 mi) north of Williams Lake on Highway 97. 116 km (72 mi) south of Prince George. 74 km (46 mi) west of Barkerville. Transportation to the area is available by several airlines servicing Quesnel as well as Greyhound Bus lines. Annual Events: Billy Barker Days (July); Tournaments - Horseshoe, Baseball & Ladies Golf (Aug); Quesnel Fall Fair, Cattle & Horse Shows (Sept); Snowarama - snowmobile event, Wheelers Valentine Dance, Figure Skating Carnival (Feb); Ballet & Music Festivals (Mar); Legion Trades Fair (May); Horse Show (June). Recreational Facilities: Golf courses, swimming, tennis, curling & skating arenas, parks, walking trails, auto racing, bowling alley, playing fields. Local Attractions: Quesnel Museum; LeBourdais Park, Riverfront Walk; World's Largest Gold Pan; Forestry Tours; Quesnel Pulp & Plywood Mill Tours; Pinnacles Park Hoodoo Rock Formations; Dragon Lake; Cottonwood House. Accommodations: The community offers numerours hotels, motels, & bed and breakfast inns to meet any budget. Campsites: The popular is Ten Mile Lake Provincial Park is north of town and offers camping, hiking, fishing and water recreation. Numerous other private and public campgrounds are located near Quesnel, including free BC Forest Service wilderness recreation sites.